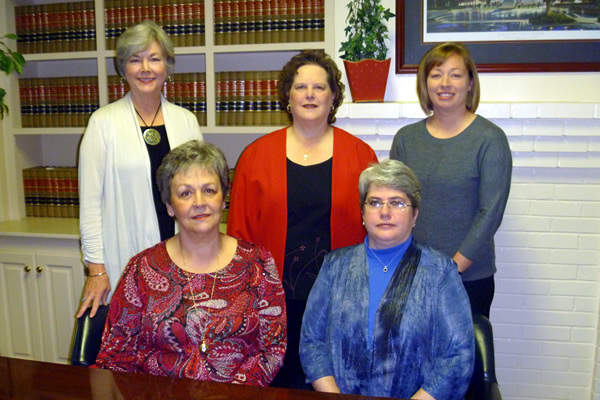 The support staff of Coleman & Tolen, LLC, is well-educated and experienced. Carolyn Robinson has lived in the Winnsboro area all her life and holds a Paralegal Degree from Midlands Technical College. In addition, she has forty-two years of experience working in the field of law. Married with two grown sons, Carolyn particularly enjoys probate and real estate issues. Karla Cooper graduated from Lancaster High School in Lancaster, Ohio, and holds a Paralegal Degree from Midlands Technical College. She has more than fifteen years of experience working as a paralegal, and has been with our firm since 2002. Karla is married, with one daughter, one step-daughter, three step-sons, and four step-grandchildren. She is active in her church and enjoys reading, needlework, camping, and spending time with her family and her two dachshunds. Patti Estes, originally from Charlotte, NC, holds a Bachelor of Arts degree from Meredith College in Raleigh, NC, and a Paralegal Certificate from the University of South Carolina. Patti has spent fifteen years in public relations and nine years in the legal field. The mother of three, she has been with the firm since 2009. Cindy Hood graduated from Winnsboro High School and holds a business certificate from Flint Hills Technical College in Emporia, Kansas. She spent five years as an administrative assistant with an engineering firm and thirteen years in the legal profession as a project assistant, legal assistant and paralegal. She is married with two grown children and six grandchildren. Katie Nicholson, a lifelong resident of Fairfield County, holds a Bachelor of Science degree in Accounting from the University of South Carolina. Katie spent over twelve years in financial reporting and accounting in the insurance industry before joining our firm in 2013. Katie is married with two children and resides in Ridgeway.